Shari Haynes is in a place she never dreamed of being. You might call the Tidewater Community College student pursuing an Associate of Applied Science in Criminal Justice a victim of domestic violence. But Haynes is a survivor of domestic violence, forging a new path for herself as an honor student, a senator in the Student Government Association on the Portsmouth Campus and as a member of Phi Theta Kappa, the college’s honor society. Haynes is sharing her story to inspire others to break the cycle of domestic violence. TCC will recognize Domestic Violence Awareness Month with its annual Red Flag campaign, a public awareness event designed to address dating violence and promotion the prevention of dating violence on college campuses. 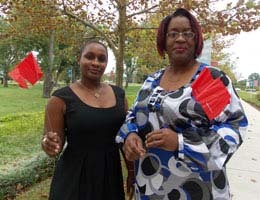 Starting Oct. 8, each TCC campus will participate by setting up red flags to draw attention to the problem. The idea behind the campaign is to create a bystander intervention strategy, encouraging friends and others on campus to speak up when they see warning signs or “red flags” for dating violence. Haynes endured domestic violence in both of her marriages, having her husband arrested each time. The final blow came when her second husband slapped her so hard across the face that she nearly dropped her toddler sitting on her lap. “I tell anyone you have to get to the point where you are sick and tired,” Haynes said. Instead, Haynes implored her children to keep their hands to themselves and stressed the value of education. Her oldest daughter, Monica, works in the medical field, son Marcus is a junior at Hampton University majoring in graphic design, and daughter Victoria is a seventh-grader at Waters Middle School. As for herself, Haynes never expected to be so outspoken about her past. Her children gave her the courage, and TCC, the platform. She gave a presentation about domestic violence in her public speaking class, wrote about it in an English class and learned more about it via an administration of justice online class. Where once she felt shame, now she feels courage. “Sometimes you have to wear those scars, and those scars turn into courage,” Haynes said.